Abstract: GLOBAL OUTPOST, Inc., in cooperation with NASA, proposes to place an ET in orbit for commercial purposes. The OUTPOST External Tank derived platform discussed in this paper is designed to service a commercial market and will also be available for governmental use. The ET can be placed in orbit with little additional energy. The platform proposed is a minimum cost, man visited facility aimed at attracting commercial ventures seeking a low cost way to use the attributes of space. Abstract: A numerical procedure is described in which the aerodynamic drag and torque in low Earth orbit are calculated for a prototype Space Shuttle external tank and its components, the LO2 and LH2 tanks, for any given angle of attack. Calculations assume the hypersonic limit of free molecular flow theory. Each shell of revolution is assumed to be described by a series of parametric equations for their respective contours. It is discretized into circular cross sections perpendicular to the axis of revolution, which yield a series of ellipses when projected according to the given angle of attack. The drag profile, that is, the projection of the entire shell is approximated by the convex envelope of those ellipses. The area of the drag profile, that is, the drag area, and its center of area moment, that is, the drag center, are then calculated and permit determination of the drag vector and the eccentricity vector from the center of gravity of the shell to the drag center. The aerodynamic torque is obtained as the cross product of those vectors. The tanks are assumed to be either evacuated or pressurized with a uniform internal gas distribution: dynamic shifting of the tank center mass due to residual propellant sloshing is not considered. Abstract: A concept for using the external tank from a National Space Transportation System for a lunar habitat is described. The tank is inserted in low Earth orbit where it is outfitted as a 12-person lunar habitat. The tank modifications utilize existing structures and openings for man access without compromising the structural integrity of the tank. The modifications include installation of living quarters, instrumentation, and air lock; and thermal-control, environmental-control and life-support, and propulsion systems. The habitat is designed for unmanned transport to low lunar orbit and autonomously soft landed on the lunar surface. Supply to the habitat is provided by a space transfer vehicle and manned cargo lander. The lunar habitat concept is feasible by the year 2000 with the concurrent development of a space transfer vehicle and manned cargo lander for crew changeover and resupply. Abstract: Imaging spectrometry combines full spectral resolution with wide and detailed spatial coverage. Data returned by the Airborne Visible / Infrared Imaging Spectrometer (AVIRIS) has been analyzed for the Cuprite mining district in western Nevada. By measuring the band depth of their characteristic absorption bands, maps of the distribution and relative abundance of the minerals kaolinite, alunite and hematite were constructed. Similar techniques can be applied to data returned from spaceborne imaging spectrometers. The location and relative abundance of ore minerals with diagnostic visual and infrared spectra can be mapped on Earth, Mars, the Moon and the asteroids using imaging spectrometry. Abstract: A new process is presented for oxygen production from lunar soils. The principal steps are: (1) Melting magnetically cleaned, degassed iron rich (mare) soil in the presence of oxyqen. (2) Controlled devitrification. (3) Cooling, pulverizing, and magnetic extraction. (4) Dissolving magnetic spinel phases in electrochemically stable aqueous mineral acid(s). (5) Electrolysis of the above solution(s) to recover iron and oxygen. Earth import elements are reguired only for steps 4 and 5 and the high temperature steps (1 and 2) eliminate materials compatibility problems of anode corrosion, hot gas collection and molten metal containment of direct magma electrolysis. Energy requirements depend primarily on efficiency of heat recovery between cooling steps 2 and 3 and the input soil heating for step 1, and the fraction of oxygen generated in step 5 diverted to step 1. The process is based on the shift in compositions of crystalline phases derived from silicate melts with oxygen chemical potential (fugacity). Under strongly reducing conditions the ferrous iron content of typical mare soil compositions appears almost entirely in silicate or titanate minerals following devitrification, but if melted in equilibrium with oxygen at higher pressures, 90% or more of the iron content appears in a spinel (substituted magnetite) phase. This phase may be magnetically separated and processed for oxygen and iron recovery. Abstract: Lunar resource utilization is critical to the economic realization of future space missions. The extraction of oxygen for space vehicles has been given top priority. Recent emphasis has been placed on a process to extract oxygen from lunar ilmenite by reduction with hydrogen. Results from previous studies, based on this process, are used as a baseline for the development of an Oxygen Liquefaction and Storage System. The system encompasses the following tasks: liquefaction of effluent oxygen from the hydrogen reduction reactor, transportation of cryogenic oxygen, and storage of cryogenic oxygen. A baseline system design is presented that requires approximately 8.1 kW to liquefy 200 metric tons/year oxygen. Waste heat from the process is rejected to the lunar regolith by radiation and conduction. The work presented herein represents the current state of an ongoing research and design effort. Abstract: Lunar anorthositic soil can be processed to produce oxygen, silicon, aluminum and calcium. A process scheme starting with the beneficiation of the ore by magnetic separation and yielding the pure products is being developed at EMEC Consultants. Simplifications in the process are possible if requirements regarding product purity and separation may be relaxed. As an example, silicon-aluminum composites can be manufactured for structural uses without complete separation of silicon and aluminum in the production process. The process scheme is flexible and readily accommodates modifications. Abstract: There are several ways to process lunar soils; however, none of them have been tested in situ. Mass and energy requirements are the main parameters that must be considered to make a choice. 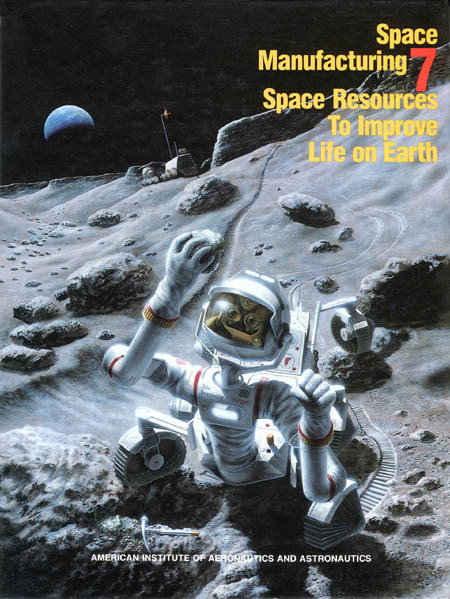 Among the feasible methods to process lunar soil, slag electrolysis has shown the smallest energy requirements; therefore, it was chosen to process lunar anorthite in order to produce silicon, aluminum and oxygen for the International Space University (ISU) lunar base design project in 1988. Silicon is one of the raw materials to produce photovoltaic cells for the lunar base and for the solar power satellite (SPS). The reasons for the choices done in this work at ISU are discussed here. Abstract: This paper addresses work done on the microwave processing of lunar simulant soils. Samples were sintered using 2.45 GHz radiation and were thermally shocked using the water quench technique. Resultant microstructures were obtained using SEM techniques and these were correlated with the observed thermal shock properties. Abstract: Carbonaceous chondrites are usually believed to be the primary constituents of near-Earth asteroids and Phobos and Diemos, and are potential resources of fuels which may be exploited for future planetary missions. In this work we have calculated the nature and abundances of the major volatile bearing and other phases, including the vapor phase, that should form in C1 and C2 type carbonaceous chondrites as functions of pressure and temperature. The results suggest that talc, antigorite ± magnesite are the major volatile bearing phases and are stable below 400°C at 1 bar in these chondritic compositions. Simulated heating of a kilogram of C2 chondrite at fixed bulk composition between 400 and 800°C at 1 bar yields about 135 gm of volatile, which is made primarily of H20, H2O, CH4, CO2 and CO. The relative abundances of these volatile species change as functions of temperature, and on a molar basis, H2 becomes the most dominant species above 550°C. In contrast, CI chondrites yield about 306 gm of volatile under the same condition, which consist almost completely of 60 wt% H2O and 40 wt% CO2. Preliminary kinetic considerations suggest that equilibrium dehydration of hydrous phyllosilicates should be attainable within a few hours at 600°c. These results provide the framework for further analyses of the volatile and economic resource potentials of carbonaceous chondrites. Abstract: The ambitious space missions of the future require a reliable source of electrical energy that exceeds the limits of current technology. The United States is developing space reactor power system technology to meet the projected civilian and defense needs for the 1990’s and beyond. This program, known as SP-100, will remove the restrictions on electrical power generation that have limited space missions and will enable the fuller exploration and utilization of space. This paper describes the flexible system that will provide 10’s to 100’s of kilowatts of electricity and summarizes key technology development underway. Abstract: Beamed power transmission and transportation systems in the equatorial plane are discussed in the context of the Solar Power Satellite System. A scenario in which a mass of 60,000,000 kilograms is transferred annually from low earth orbit to geosynchronous orbit for the construction of solar power satellites is examined. The costs are estimated for such a transportation system. Key technologies are discussed. Abstract: The Space Studies Institute has formed a Teleoperations Working Group and charged it to investigate how to perform meaningful experiments in time delayed teleoperation at low cost. After conducting a search of available devices, a toy robot, the Radio Shack Mobile Armatron was evaluated and selected for use. The device is mobile, has a four degree of freedom arm, is amenable to external control and is inexpensive. A time delay control unit which simulates the 3 second round-trip communications delay between the Earth and Moon was constructed. Two types of experiments are reported here. The first type is a maze run experiment with four variations and the second type is a manipulation experiment involving the stacking of 3 blocks. The first 3 variations of the maze experiment were used to provide an undelayed baseline for comparison with the fourth time delayed variation. The manipulation experiment used time delay for 49 trials and had 2 undelayed trials using a different control system. Our experiments indicate that the 3 second delay associated with lunar teleoperations controlled from Earth is not a significant barrier to the performance of basic tasks and that our hardware will allow further evaluation of the feasibility of lunar teleoperations. Abstract: Because of the much lower escape velocity, there is a great advantage in manufacture of solar cells for use in space on the moon rather than on Earth. Silicon is abundant on the moon, and new refining methods allow it to be reduced and purified without extensive reliance on materials unavailable on the moon. Silicon and amorphous silicon solar cells could be manufactured on the moon for use in space. Abstract: We explore near-term non-terrestial materials usage in Solar Power Satellites (SPS’s). Three materials availability scenarios are considered: (1) Shuttle external tanks (ET’s). (2) ET’s and lunar glass composite. (3) ET’s, lunar glass composite, lunar iron and lunar oxygen. We investigate power conversion system alternatives of silicon planar, gallium arsenide concentrator, thermophotovoltaic (TPV), and solar dynamic. Abstract: Further developments of the COPPATRUSS system for the construction of very large truss foundations in space are presented. The unique geometrical basis of the patented General Electric Company system, namely the three-dimensional grid generated by the perfect-packing 60/90° tetrahedral cell, is described in terms of zero-order structural and higher-order architectural grids. The zero-order grid preserves the classical space-frame structural grid while the higher-order grids define truly modular building blocks with which truss architectures can be built. This systemmatization of truss composition partitions the construction process for very large trusses to the fabrication of zero-order blocks, mainly utilizing automatic machinery and relatively simple assembly of these units into the final configuration. Such a process promises not only rapid construction but also the ability to assemble a set of identical building blocks in an almost unlimited variety of architectural forms. Several characteristic structures are discussed including a 5 GW solar power satellite platform. The paper concludes with an argument for establishing a worldwide standard for very large truss construction in space. Abstract: An international lunar base consisting primarily of Space Station Freedom partners is recommended as a goal. Political and economic issues are examined; key aspects of a future legal regime regarding lunar resource use is given. Abstract: The outer space environment is rich in opportunities for entrepreneurial business organizations. The experiences of Geostar Corporation are reviewed as a case study in successful space business. Geostar operates spacecraft 35,000 kilometers above the equator to provide a “backbone” for its mobile radio communications systems throughout much of the Western Hemisphere. These systems are projected by the U.S. Department of Commerce to yield over $1 billion in revenues per year by the mid-1990’s. The successful Geostar business formula should be applicable to many entrepreneurial activities in outer space, on the lunar surface and among the asteroids. The key elements of this formula are unique technology which fulfills important human needs, a capital investment of not more than 10-20% of the ultimate funding needed, and a dedicated group of talented people with a “if there’s a will, there’s a way” attitude. Abstract: There is virtual unanimity among those intimately familiar with space exploration on why man has yet to begin a serious breakout from the surface of the Earth: The cost. Although great emphasis has been placed in engineering studies on developing ways to reduce the cost of transporting payloads to LEO, even the most optimistic technical solutions still leave us at least an order of magnitude short of providing the impetus for breakout. This paper concludes that the price of doing business in space can be lowered through three means: 1) use of the United States tax code to spur private investment in space through preferential treatment similar to that given to the railroad and oil and gas industries; 2) more effective use of the statutory authority granted NASA to create government/industry cooperatives in the mold of the Japanese MITI; and 3) generating short-term revenues from space enterprises by truly commercializing their nature. Abstract: The agenda for the human future in space is heavy with proposed macro-projects such as the Moon Base, the manned Mars mission, solar power satellites, and the mining of non-terrestrial materials. Given their cost and their implications, international cooperation may be necessary. Other nations can bring significant technical and financial resources, making them potentially attractive partners. Many models of international cooperation will have to be considered, and the international dimension will have to be integrated into the planning process at an early stage. The United States has limited experience in cooperation in macro-projects, though the Space Station will be an important precedent for future projects. It is not too soon to begin the process of international consultations on how we might work together on future macro-projects. Some steps are suggested. Abstract: The Space Station Freedom presents the opportunity to expand the commercial development of space by U.S. industry. Among the areas in which industry can be involved in the Freedom program is a commercial basis – commercial infrastructure. NASA has begun to develop the appropriate policy framework to encourage industry to consider commercial infrastructure opportunities and integrate those into the Space Station Freedom Program. The first step NASA has taken to develop the policy framework was to develop and publish in draft the Space Station Freedom Commercial Infrastructure Policy, Procedures, and Criteria. This document outlines NASA’s interest in receiving unsolicited proposals to provide commercial infrastructure associated with Space Station Freedom, procedures with which such proposals will be evaluated, and the criteria which will be used in such evaluations. The paper provides an overview of the current policy framework for Space Station Freedom commercial infrastructure and an overview of industry comments received to date on the policy. Abstract: This paper discusses the reasons companies benefit from transferring technology. It reviews the obstacles to the domestic commercial space industry that will result in more business being transferred overseas and what role the transfer of technology plays in the transfer of business opportunities. Abstract: In recent NASA, American Bar Association and AIAA Sessions and Panels on Space Debris, there is an almost unanimous consent by lawyers and scientists that the time is now to begin international preventive measures to control and hopefully reduce the rate of growth of space debris population and possibly the total space debris population at LEO and GEO. My remarks are in three parts. The first will summarize United Nations work on the Peaceful Uses of Outer Space at its March 1989 session on the subject of Nuclear Power Sources and Space Debris. The second will review the recent speeches and published statements of Dr. Nicholas L. Johnson, Scientist, and Dr. Nicholas M. Matte, Dean, Institute of Air and Space law, McGill University. The third will review the current status on colored slides of the environmental implications and responsibilities regarding space debris and outer space. The desirability of a new space debris treaty is now becoming very clear to both lawyers and scientists. Abstract: There is a growing need for technology assessment on a global basis. And in particular there should be an international group to study the effects of space development on the Earth. Abstract: This paper presents an aerobic composting system for microgravity operation. The composting system processes human and plant wastes into a material that is a suitable growth medium for plants. A combination of forced and suction aeration control the flow of oxygen through the mass of composting material, the moisture content, and temperature of the material. The composting process consumes oxygen and produces carbon dioxide that is provided to the plant growing chambers. The composting will also generate heat that must be removed from the composting area. The fully composted material is transferred from the composting chamber to a plant growth chamber where it is used as a growth medium for plants in a configuration that ensures the optimum aeration and water/nutrient supply for plant growth. Abstract: For fifteen years, NASA at the John C. Stennis Space Center has been involved in bioregenerative component development for air, water, and waste treatment. Through funding from the NASA Technology Utilization Office, technology developed by this project has been transferred to single homes, small communities, and large municipal users such as San Diego, California, as well as commercial investors interested in capitalizing on the air purification spinoff products. The products of this project have now been integrated into a unique, bioregenerative habitat with a self-contained waste treatment and water reclamation system. Biological processes are used in the energy-efficient living quarters for air reclamation and revitalization. Food products will also be produced in the waste treatment train. This integrated “living” system, which minimizes the use of mechanical and energy-consuming treatment systems and maximizes the use of bioregenerative processes, is the culmination of the component development work and the beginning of a more complex and detailed project. The development, test, refinement, and verification of this unique bioregenerative habitat will yield information necessary for the safe and efficient use of biological processes in closed habitats both in space and on Earth. Abstract: The goal of the first phase of the CELSS Breadboard Project is to develop and test a ground based CELSS at a one-person scale. The successful integration and operation of such a system should establish the feasibility of developing a CELSS that will meet life support requirements for crews during long duration space flights. Over the past two years, personnel of the Breadboard Project have concentrated on the construction and initial testing of a large biomass production chamber, the primary facility for the biomass production module for this CELSS. This large plant growth chamber is now functional and the first full biological test of the facility was completed in January 1989 using wheat as the test specimen. Associated laboratory research during the past year has concentrated on production studies with other crop species, microbiological characterization of hydroponic solutions, enzyme conversion of cellulose to sugar, aquaculture techniques, recovery of inorganic elements from plant waste through water leachate, and the development of a nutrient delivery system for microgravity. This paper will status this work and present future plans especially those that are important to establishing a complete CELSS including food processing and waste management activities by 1993. Abstract: This paper describes in somewhat abbreviated form the natural line of reasoning which has brought us to design launch structures and to establish the basic principles of an appropriate service contract with its entitlements and obligations, designed specifically for the “small payload” to be launched by Arianespace using the European launcher. Abstract: An enhanced computer simulation of a coaxial electromagnetic launcher has been developed using Smalltalk-80TM and its object-oriented environment. The simulation iteratively solves linear, first-order, coupled difference equations to calculate the electromagnetic interactions between coils. Alternative methods for providing power to the bucket are investigated, for both ohmic coils and a high temperature superconducting bucket coil design. Superconducting bucket coils allow for pull-only mass-driver designs that are not feasible with ohmic coils. A qualitative discussion of the design advantages from the use of superconducting drive coils is also presented. Abstract: The concept addresses the transport of gaseous 3He in temperature equilibrium with the liquid hydrogen and liquid oxygen in a modified shuttle external tank. Data from lunar samples show 3He in recoverable quantities sufficient to support large-scale controlled-fusion generation of electrical power on the Earth. Fusion based 3He results in charged particles which permit direct electrical conversions of their recoil energies. A modified shuttle external tank operating as an unmanned 3He tanker has the capability to transport about 5000 kg (11025 lb) in each round trip between lunar orbit and low Earth orbit; fusion of about 2500 kg (5512 lb) per month would supply the electrical power requirement for the United States. In addition, such a tanker shows the capability to make the round trip using 02 – H2 propellants, and the by-products of 3He extraction produce 02 and H2 in quantities that exceed the propellant requirements. The concept first describes the internal modifications to accommodate 3He, and then, the external modifications to incorporate a propulsion system and an aerobrake. Estimates of the system masses and an assessment of propulsion requirements show the round trip capability. The concept also includes a description of the lunar orbit servicing and transfer operations. Abstract: The problem of space debris has been looked at for sometime, but to date, no clean up has been done. This article will summarize the debris problem and will address the main problem: how to clean up the debris. There are approximately 7000 man made, trackable objects in orbit, 10 cm or larger. Most of these are known to be debris or nonfunctional spacecraft. In addition to trackable objects, there are 8 to 10 times as many untracked objects. The debris hazard now exceeds the meteor hazard by 5 orders of magnitude! In order to clean up the debris, we will initially focus on removing larger objects from orbit. We propose a garbage collector which is small, simple, and inexpensive. It is a drag device which can be attached to the debris and deployed to increase the drag on the junk by orders of magnitude causing its orbit to decay rapidly. Abstract: This paper is intended to show that, by using a nuclear rocket, using Lunar oxygen as reaction mass, this country can industrialize Luna over a fairly short period. We can do it even assuming that there is no increase in NASA’s current budget and no decrease below current launch costs, all of this meaning that there will be only limited resources available for the return to Luna. The nuclear-oxygen rocket proposed uses existing technology. It could take off from the surface of Luna, achieve low orbit about it, drop off a very substantial payload (at least SO metric tons), de-orbit, deccelerate, and soft land at its point of departure. During this whole mission it would not drop off any spent stages, tanks, engines, or any other form of hardware needed for a second trip. It would use no fuel flown from Earth and little, if any, mass in the form of replacement parts. With a relatively modest R&D effort, this shuttle could be ready to fly long before we actually return to the Moon. Abstract: Preliminary logistic support analysis (LSA) suggests that the cost of manned spacecraft could be less than the cost of unmanned spacecraft for moderately complex Mars class missions if technology to enable component level repair of equipment by flight crew is available. It is shown that component level repair by flight crew is an enabling technology for manned Mars class missions. Necessity of this enabling technology is proved by quantitative analysis of reliability and supply support requirements. Elements of the enabling technology are described. Abstract: The problem addressed here is to supply lunar materials to off-moon users and to provide convenient access to the lunar surface for prospectors and scientists. Systems designed to address this need typically include a base located on the moon. This paper presents a design which has no lunar surface base, yet meets the transportation needs defined above. Abstract: Previous studies have proposed the production of lunar liquid oxygen (LLOX) as an economical cislunar propellant source. Oxygen reduced from ilmenite (mined from lunar regolith) could be liquefied, and launched to lunar orbit collection points in small canisters by a simple electromagnetic mass driver system. It was suggested at the 5th Princeton/SSI Conference that se1f-maneuvering canisters could avoid the as yet intractable engineering problem of orbiting “mass catchers” to collect the large number of separately launched pay loads. Such canisters, once emptied into space-based storage facilities, could be returned en-masse to the lunar surface for reuse. Considered an intermediate step in our understanding of LLOX supply architectures, this paper focuses on engineering the “smart” canister and developing requirements for its handling systems on the Moon and in space. Particular attention is paid to the appropriate avionics, and how maneuvering from mass driver release to canister berthing is accomplished. The canister performs orbit change maneuvers required to rendezvous with the propellant collection space platform. It then maneuvers within berthing range of the platform’s robotic loading dock. Inspection and required maintenance are performed at the LLOX recharge facility on the lunar surface. Also discussed in detail is the canister propulsion system, including propellant choice (and source), thruster type, and engineering to withstand launch loads of hundreds of gs. It is proposed that, in the near term, Earth-supplied gaseous hydrogen be used as the canister fuel with the LLOX as oxidizer at a mixture ratio of 1:50. Later, lunar metals or hydrogen may be used as fuel for a totally Earth-independent LLOX supply network. Abstract: Concepts for providing continuous power for a solar powered moonbase over the 354 hour lunar night are reviewed. The categories of solutions considered are electrical storage, physical storage, transmitted power, and “innovative concepts”. Electrical storage is the most well-developed option; the most likely long-term storage option is regenerative fuel cells with cryogenic reactant storage. Less developed electrical storage options are capacitors and superconducting inductors. Physical storage options include storage of potential energy and storage of energy in flywheels. Transmitted power considers use of microwave or laser beams to transmit power either from orbit or directly from the Earth. Finally, innovative concepts proposed include reflecting light from orbital mirrors, locating the moonbase at a lunar pole, converting reflected Earthlight, or moving the moonbase to follow the sun. Abstract: Numerous concepts have been considered, and are still being presented, for permanent lunar base structures. These concepts try to account for the lunar environment and its particular requirements. Among others, the construction methods and materials, structural systems, design loads and conditions, and, of course, the economic cost of each solution, are some of the parameters that have to be considered in any structural concept in order for that concept to be successful. It is extremely difficult to favor one concept over the others since each has some strong, attractive features and, at the same time, some drawbacks. Some of the concepts, for example, stress future expandability while ignoring lunar surface exposure effects. Others have the advantage of being structurally sound while ignoring the availability of construction materials. In this paper, we will describe an analytical method to quantify these concepts, and provide a framework for evaluating new ideas in the future. This analytical approach will help scientists and engineers study and understand the merits of different concepts (available and future). It will also introduce more quantitative approaches to the, mostly intuitive, conceptual ideas presented so far. Many details have been omitted here. They may be reviewed in a paper under the same title submitted for review to the ASCE J of Aerospace. Abstract: On Earth, many cities are at odds with their environments due to inadequate planning, often to site selection itself. Environmentalists and economists have become antagonists as a result of such problems which date from the time when these cities emerged from tiny outposts. Little was known or anticipated about the implications of urban growth. Site selection for a lunar base will require that many purposes be considered, that long term economics be addressed and that special consideration be given to human needs, particularly for contact with nature. The purpose of this study is to solicit expertise from environmentalists who specialize in these areas on Earth such as ecologists, planners, landscape architects, urban designers, and architects; who otherwise might not contribute to the space program. My goal is to establish a checklist for lunar base site planning, one that combines ecological and architectural goals with economic ones. It will also provide a flexible land use planning tool that can help to clarify mission objectives and integrate functions for any scenario to which it is applied. Abstract: The time that an astronaut spends in space and man’s ability to colonize planets of various sizes may be constrained by physiological adaptations to new gravitational environments. The most troublesome symptoms have resulted from the effects of weightlessness on the vestibular, vascular and skeletal systems. Space adaptation syndrome (SAS), a self-limited nausea that appears soon after achieving weightlessness, may result from sensory conflict between vestibular labyrinths, otoliths and vision. Attempts to select astronaut candidates who do not develop space adaptation syndrome have been unsuccessful. Also, intravascular volume distributed cephalad in weightlessness is shifted caudad upon reentry, causing a reduction in cardiac preload that may be responsible for tachycardia, arrhythmias and hypotension. Another adverse effect is accelerated bone mineral excretion caused by reduced weightbearing which can present with renal calculi in zero gravity and stress fractures upon return to Earth. A potential solution to maladaptation in weightlessness is artificial gravity, but before engineering implementations may be considered several parameters must be determined: (1) the magnitude of inertial acceleration required; (2) the time-intensity effect of inertial acceleration on relevant physiological systems; and (3) an acceptable angular velocity, if rotation is required to generate artificial gravity. In a rotating system, inertial acceleration is a function of radius and angular velocity. Rotation will develop Coriolis and cross-coupled accelerations on the vestibular system with each head movement, potentially exacerbating space nausea. If the magnitude of inertial acceleration needed to prevent bone loss and orthostatic intolerance is much less than Earth gravity, lower rotation rates and a smaller radius may be considered. A method of creating artificial gravity in Earth orbit without apparent spacecraft rotation involves tethering spacecraft in orbits of different radii. Tethered spacecraft in Earth orbits several hundred miles apart could generate artificial gravity of the same order of magnitude as the moon’s. Artificial gravity may become a practical countermeasure, if only a fraction of Earth gravity will prevent clinical complications of spaceflight. We have developed a suspended rat model that simulates ambulatory forces on weightbearing bone at 0% (weightlessness), 25%, 50%, 75% and 100% (control) of Earth gravity. Dynamic histomorphometry of rat tibias demonstrated that trabecular bone mass described a sigmoid function of weightbearing, with a plateau at 25-75% weightbearing (intermediate between weightlessness and control). A similar sigmoid curve describes bone formation rate as indicated by fluorescent tetracycline labels and trabecular osteoid seam width. Bone resorption, indicated by osteoclast number/mm, is constant in rats suspended at 25-100% weightbearing, and significantly elevated in rats with nonweightbearing femurs. These data, although preliminary, suggest that only about 25% of Earth gravity may be needed to prevent metabolic bone abnormalities in spaceflight. Similar experiments may help to define gravitational parameters that preclude cardiovascular and vestibular side effects of orbital missions. Abstract: Anaesthesia, as a specialty of Medicine, is at the forefront of the interface between Science and the Practice of Medicine. Since I introduced that potential paradigm known as Extraterrestrial Medicine (ETM) in 1981, it has become apparent that Anaesthesia too may benefit from application of the principles of ETM. Differential ventilation-perfusion ratios throughout lung substance, which can be a threat to patients with impaired cardiorespiratory function undergoing anaesthesia, are likely to be eliminated in microgravity. This may also increase the effectiveness of high frequency ventilation. Continuous positive pressure laminar flow ventilation, impossible in significant gravity, may become practicable allowing vastly improved control over respiratory function than has been available before. Finally, variations in helium-oxygen mixtures may allow superior control in situations where there is significant respiratory obstruction. Abstract: In proposing a permanent lunar base we are concerned that a permanent base within itself would be less productive then having an on-going exploration of the lunar surface by Multiple Vehicle Low Orbit Bases (MVLOB). By using three or more ships, each isolated from the other, they become independent life support systems housing specialists from many disciplines. This concept insures a higher probability of survival for all involved, as opposed to having a specific base which would house all individuals. Abstract: A trade off study, for the selection of the most appropriate atmospheric pressure level for a lunar base, was performed at the International Space University’s (I.S.U.) 1988 Inaugural Session at the Massachusetts Institute of Technology. At first, the atmospheric pressure issue had been non-existant; it was taken for granted that the atmospheric pressure level for the base would be 14.7 P.S.I. ; that of sea level. The possibility or considering an alternative, and lower atmospheric pressure at 8 P.S.I. was brought into the arena by the architects only later in the design process, on the basis of significant structural cost savings. This proposition initiated a search to identify all the factors and the effects a pressure reduction would have on them. The factors investigated included medical and research considerations, ease of extra-vehicular activity, safety and quality control, and economical trade-offs. It was decided early on to consider 9 P.S.I, as the lower pressure alternative instead of 8 P.B.I. because the percentage of O2 necessary at 8 P.S.I. (33%) to provide a normal environment for humans would have been over the safe limits of the flammability curve. The major driver that opened the study, namely the cost factor, was disproved by showing that the costs of recertification and quality control of equipment functioning at a lower pressure would greatly outweigh the structural cost savings. It was projected that a 9 P.S.I, base would incur an extra cost of $5,844 billion and save only $400 million on structural costs, making the total extra cost $5,444 billion, in comparison to a 14.7 P.S.I, base. Bearing this in mind, together with all the other factors, we made the decision to maintain a lunar base at 14.7 P.S.I. These factors may be viewed at a glance in the table at the end of this paper. Abstract: The intent of this paper is to establish the applicability of GFRP, particularly Dimethyl-isophtalate glass filament rod, as reinforcement for precast structural concrete elements, in lieu of conventional steel rods or wires. If a material could be used to replace steel, cheaper, lighter and abundantly found all over our planet and especially on the Moon, (silica, SiO2, for glass manufacture) with the same, if not higher, tensile properties of steel, if synergically combined with a plastic carrier, a new science in construction and structural analysis could be born. The proof that lunar soil is cementitious is true beyond any doubt. Gravel rocks and silica-sand are also abundant on the Moon. Glass fibers fabricated on the Moon could become a true possibility. Permanent settlement/habitats on the Moon are within the realm of relatively immediate future projects. Thus the idea of using local materials is appropriate within the concept of a 3rd phase of permanent construction facilities, phase I being the Apollo landings, phase II yet to come, a temporary above ground lunar establishment, and finally phase III, a permanent underground reinforced concrete settlement/habitat for indefinite duration. Through a Fairleigh Dickinson Univ. grant-in-aid, the author established actual reduced-scale modular precast GFRP reinforced concrete samples in the structural testing lab, within available norms; thus an innovative chapter of structural material analysis could be subsequently conceived. This analysis could lend itself not only to permanent reinforced concrete structures on the Moon, but on any other planet where silica is abundant and cement could become a local product, by refining and reducing appropriate local ores. The least said about 3rd world countries, right here on Earth, which have plenty of sand, but without a domestic steel production industry. Manufacture of glass filament fibers is comparably cheaper than steel. Three modular glass-reinforced concrete beam shapes were considered and tested: “I”, “T” and rectangular. Abstract: Simple synthetic silicate materials, with various compositions within the quasi-binary eutectic system Diopside (CaO MgO 2SiO2O3 2SiO2), Anorthite (CaO Al2O3 2SiO2), and samples of a complex terrestrially occurring lunar basalt simulant, known as Minnesota Lunar Simulant (MLS), were float zone melted and solidified in an arc image furnace. This work was conducted as part of an interdisciplinary program of extra-terrestrial silicate materials research, aimed primarily at the development of the technology required to process engineering materials from extra-terrestrial silicates. The samples were solidified at various rates ranging from 1 to 180 mm/hr. At growth rates less than 6 mm/hr, samples of each composition solidified as wholly crystalline materials, while at higher growth rates, samples of MLS and synthetics of compositions intermediate between anorthite and diopside showed decreasing proportions of crystalline material. In addition, MLS samples demonstrated crystallization kinetics sensitive to atmosphere; samples grown in air showed greater crystallization rates than those grown in argon. Electron microprobe analysis showed the crystalline phases to have compositions corresponding to common igneous minerals. A floating zone solidification procedure in an arc image furnace was shown to have many advantages over other silicate crystallization procedures (particularly, for the intended program of research). Abstract: A nonprofit enterprise with worldwide support can mount a Mars expedition long before the U.S. or Soviet governments are ready. Research shows that more than $6 billion can be raised for the expedition through sale of TV rights and other sources. Preliminary cost estimates show this is sufficient to cover expenses of a frugally managed private effort.